A major crackdown has begun in Discovery Gardens, as scores of “illegal” satellite dish antennas are being removed, Emirates 24|7 can reveal. A number of the dish antennas have already been removed from a number of buildings in the community, which houses over 22,000 apartments. “Residents had been given warning to remove the antennas, but many of them have ignored these warnings. Now, all the antennas are being removed,” building watchmen told this website. They were, however, not aware of any fines. Since 2010, Nakheel, the master developer of the community, has been working closely with Trakhees, the regulatory arm of Ports, Customs and Free Zone Corporation in Dubai, to inform residents to stop installing dish antennas on the terraces and balconies and hang sheets, clothes, curtains, rugs, mops or laundry on balconies or railings of homes. Several notices have been issued with warning being given to residents. Residents have been informed through notices that violation can result in fines of Dh500. Trakhees supervises residential communities, which also includes Jumeirah Heights, Jumeirah Village, Palm Jumeirah, Jebel Ali Downtown, Jumeirah Lake Towers, International City, Discovery Gardens, etc. In 2015, the Department of Economic Development rolled out a campaign, taking down illegal satellite dish antennas. A notice, which it issued, said: “The advertisement, sale and/or distribution of television service by unlicensed, unauthorised and unlawful television service providers in the UAE is illegal. Dish TV/Tata Sky/Sun Direct/Airtel Digital TV are not authorized in the UAE, and the sale/use of their dishes, receivers and/or smart cards (or those of any other unauthorized operator) violates intellectual property rights and related laws of the UAE. “Any person and/or business selling, using and/or promising the aforementioned illegitimate TV services will be contributing and fostering criminal activities, such as organised crime and is liable to fines and/or jail terms,” it added. One of the prime reasons for residents opting for satellite dish antennas is that they are far cheaper than the official TV packages within the country. A Dish TV package, beamed through a satellite dish antenna, costs between Rs2,500 to Rs3,000 (Dh200 to Dh 240) for a year, with a bouquet of Indian channels on offer, compared to Dh120 a month for basic Hindi channel package. 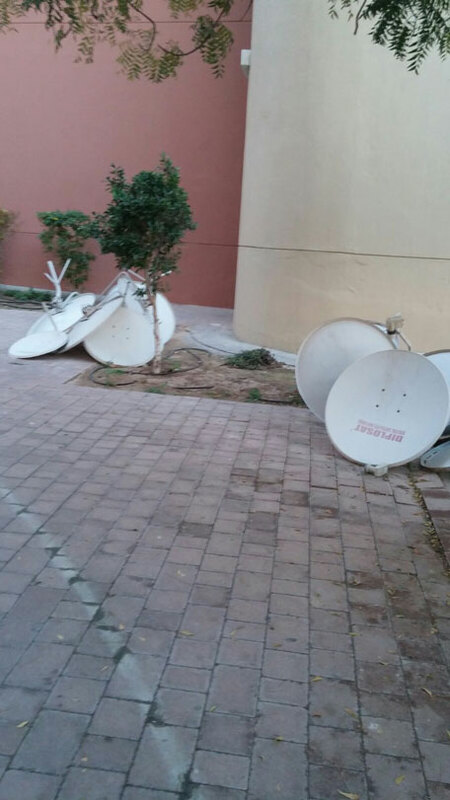 In March 2015, the Municipality of Abu Dhabi City started strictly enforcing a local law regulating satellite dishes, calling upon landlords, tenants, investors, and real estate companies to remove the dish antennas along with cable extensions that are mushrooming in a haphazard manner on the walls, rooftops and balconies of buildings, or face a hefty fine of Dh2,000. 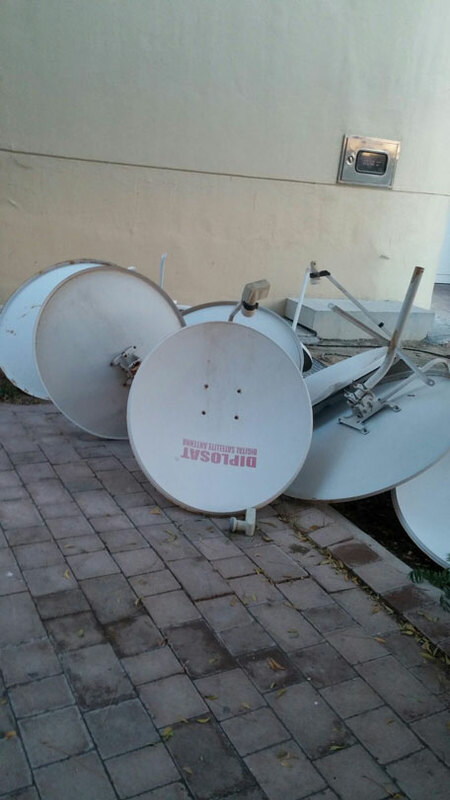 Although there has been a law since 1997 on dish antennas in Sharjah, the emirate started enforcing the regulation strictly in 2012 banning residents from installing satellite TV dishes on their balconies or roofs with violators facing fines of up to Dh500. All these crackdowns across the emirates are aimed to maintain the aesthetic appearance of the city, all the Municipalities have said.